Teaching fractions is often one of an upper elementary teacher's greatest struggles. 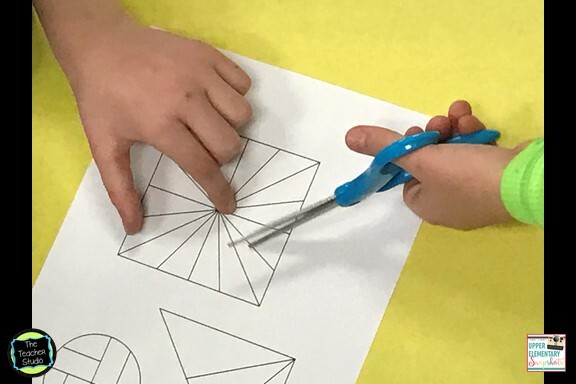 Fractions, despite being very "visual" ask students to think differently about numbers and to be able to reason at a much higher level--a new kind of thinking for many of them. Many math textbooks move students very quickly into computation related to fractions...they start teaching them to find equivalent fractions by multiplying the numerator and denominator...having them "fill in the blank" to identify which fraction is greater, and so on. For students who learn computation easily, we sometimes miss when some other basic understandings are missing. For this reason, I like to put my students in positions where they have to do a ton of "reasoning" and math talk to help ME learn about the level of their understanding--and for THEM to have to explain with precision their understanding. Check out this task we did to kick off our math class last week. I planned on 20 minutes--but we spent 45 VERY engaged minutes deepening our understanding! Although we have been working on equivalent fractions recently, I have overheard a few discussions and comments from students that led me to believe that we may have a few misconceptions remaining about the idea of equal parts. We had already tackled a few--that you can't divide a circle by making vertical lines, you don't add denominators (working with "unit fractions" really helps with that misunderstanding! ), and that equal parts don't all have to look the same. 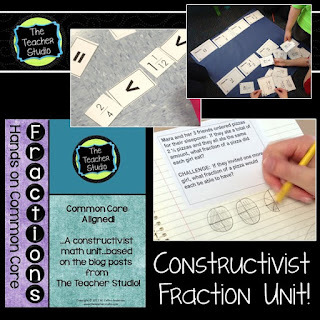 Check out THIS POST and THIS POST from last week to see more fraction lesson ideas. On this day, I gave my students some "tricky" shapes and simply asked them with a team of three to decide if they were or were not divided into equal parts. The key? They had to be able to PROVE it so that others would understand their reasoning. They were told to use their piece of bulletin board paper to create a display to show their thinking. "Can we cut them out?" Sure. "Can we draw on them?" Sure. "Can we use glue?" Sure. "It seems about the same size." They explained that when they folded the flap over, that they noticed "extra" so the edge pieces could not be equal to the middle section. They also admitted that at first they HAD thought it was divided into thirds because it "looked like it" so they were pretty excited to see that they had a mathematical explanation for something their eyes couldn't see. 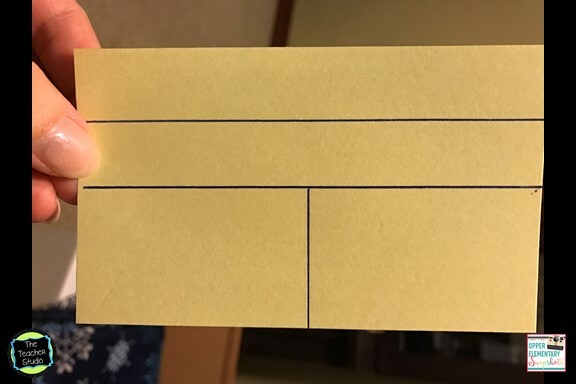 I reminded the students that we had decided a week or so ago that this WAS, indeed, divided into equal parts because each piece was "a half of a half"--and then asked the team that was measuring if the measurements were the same. You could see their wheels turning...and some of them even started looking for ways to use the "half of a half" theory in their posters. One group was getting quite a bit of attention from the groups next to them for their organization. We've been talking about making our work "accessible" to others by organizing it, labeling it, and explaining clearly so this group got lots of compliments--and it motivated some other groups to "up their game" a bit! After working for quite a while, we did a gallery walk where we checked out the work in the other groups, and then came up front. Different students offered to explain their thinking by using the document camera--and we practiced our accountable talk stems...agreeing, disagreeing, adding on, asking for clarification, and so on. We had a GREAT discussion and students used incredible thinking and math language to explain their ideas, to ask questions of each other, and to really force students to critique the thought processes and explanations of their classmates. Cool stuff! So...I can't wait to continue our discussions as we look for other patterns and generalizations we can make as we move through our unit. 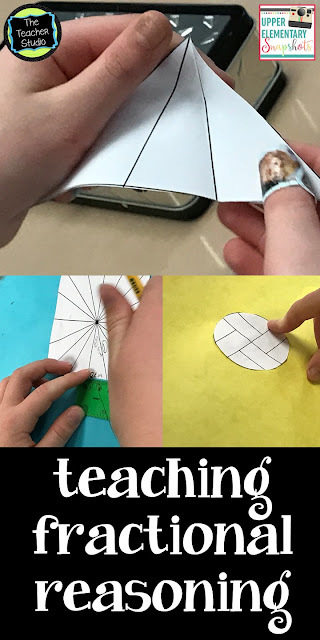 This lesson is a version of one of the 16 lessons in my fractions unit--all geared toward really getting students to think deeply about fractions. Hope everyone is staying warm--and if you are teaching this next week like I am, may the force be with you!